NN4M is a mobile solutions expert and has been recognised as one of the UK’s leading retail app developers. "Alex had excellent technical skills and good experience when he joined. He was hard-working, with great enthusiasm. When he started he was fairly confident and we have watched that grow. Overall his working attitude was fantastic. We were happy to contribute to Alex’s learning by exposing him to all projects and aspects of the business. In return, we got a great result. It has helped us as a business with our training and development and has been an excellent learning experience for our staff and managers. They are now equipped to do it again. Flexiant provides Cloud infrastructure software and services for hosting providers, data centre owners, telecommunications operators and enterprises. "Diana did a summer placement with us, but she will hopefully continue on part time. e-Placement Scotland most definitely succeeded in matching the right candidate to the placement opportunity provided and all our expectations were met. Diana’s technical skills were excellent. She asked all the right questions and learnt a lot. She had a brilliant attitude. Diana was quite shy initially, but became more confident, participating in discussions and putting her point of view across. It was good to see. We had an excellent experience of e-Placement Scotland. Other employers will be pleasantly surprised if they get involved. We feel we made more than a good return on investment and are confident that an offer of full time employment will be made upon graduation. 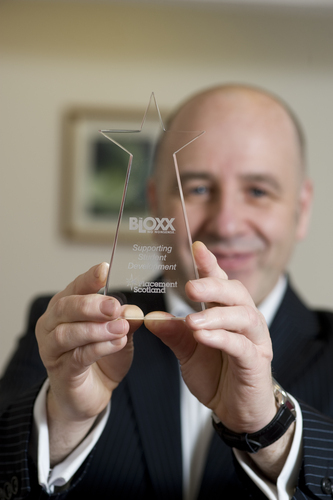 Bloxx is an award winning web filtering company. In 2007, they were recognized by Deloitte as one of the UK’s Top 50 Fastest Growing Technology Companies. "April had very good technical skills and picked things up very well. She had a brilliant attitude. She was exposed to all areas of the business and got a very positive experience from it. She was always productive and proactive in asking for work. She definitely made an impact in helping out in the development/testing team. April was shy and low in confidence to begin with. This improved during the placement as she interacted more with others in the team. She became less nervous, more comfortable with the role and got used to the environment. Want to see and hear more? Then take a look at our video testimonials on YouTube.